We all have childhood dreams, don’t we? Some things that once seemed unattainable all of a sudden become possible, as the pieces of the puzzle miraculously come together. 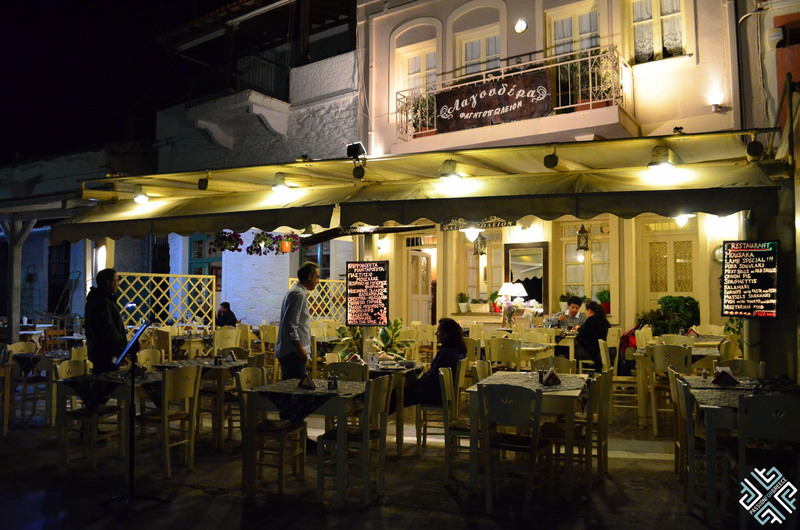 This is the story of Vasilis Boutsikas who runs his family taverna Lagoudera located in the Korissia port of Kea. 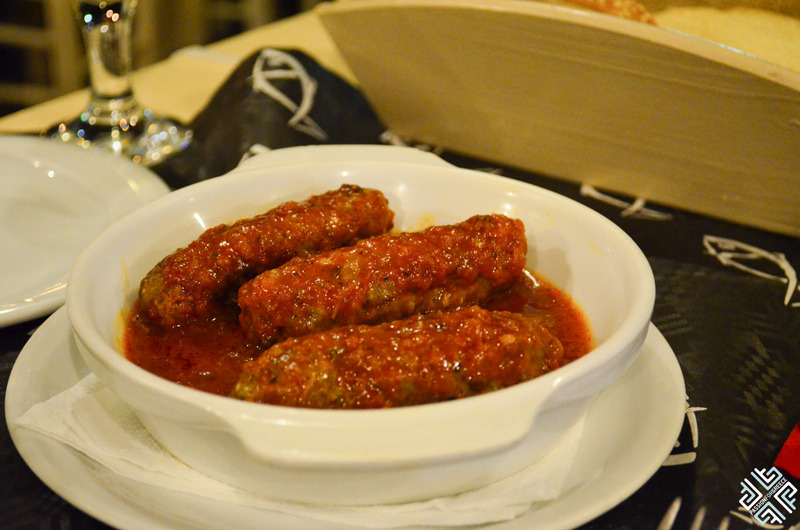 During our trip to Kea one fine evening we found ourselves in the company of Vasilis, enjoying a delicious meal and listening to an inspiring story of what is the meaning of Lagoudera, why he named his taverna like this and how it connects to his teenage days. So the story goes… Lagoudera is a part of a traditional fishing boat known as the caique, which is actually the stirring wheel that helps the boat to change direction. But why Lagoudera? In his teenage days just after having graduated from high school, Vasilis together with his childhood friends went on a trip to Hydra. 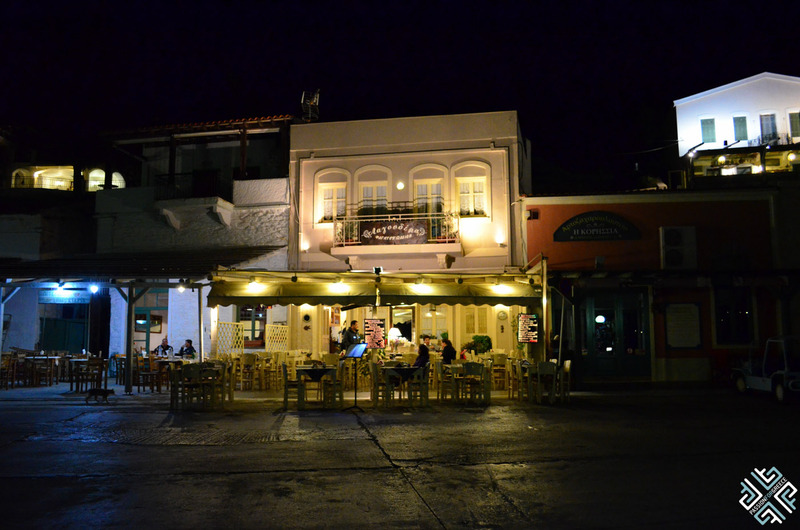 The most famous night club in Hydra back in those days was called Lagoudera, it all started back in 1958 when Babis Morres a successful businessman visited the island for his holidays and fell in love with the place where he opened Lagoudera. Hydra and Lagoudera became the favourite hot spot of the international jet set where famous people like Bridget Bardot, Elizabeth Tailor, John Lenon, The Rolling Stones, The Beatles, Maria Kallas , Onasis and Jacky Kenedy came to visit. 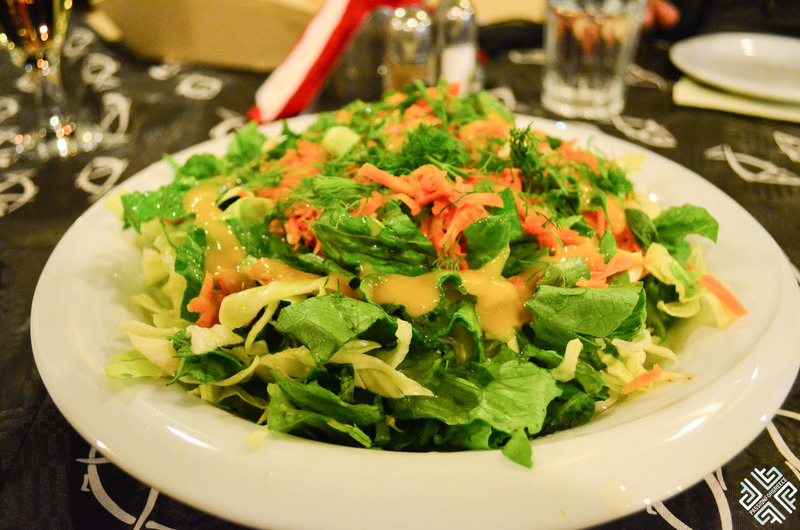 Vasilis recalls that his and his friends money put together could only afford to buy them one dish, the club restaurant was very expensive and they were very young and didn’t have any money. With a smile on his face he said “it was the place to be and we so wanted to go there.” When the time came for Vasilis to choose a name for his taverna, immediately the name Lagoudera struck in his mind, only naturally he wanted to have his own Lagoudera, the famous place that left such an impression on him back in those days. 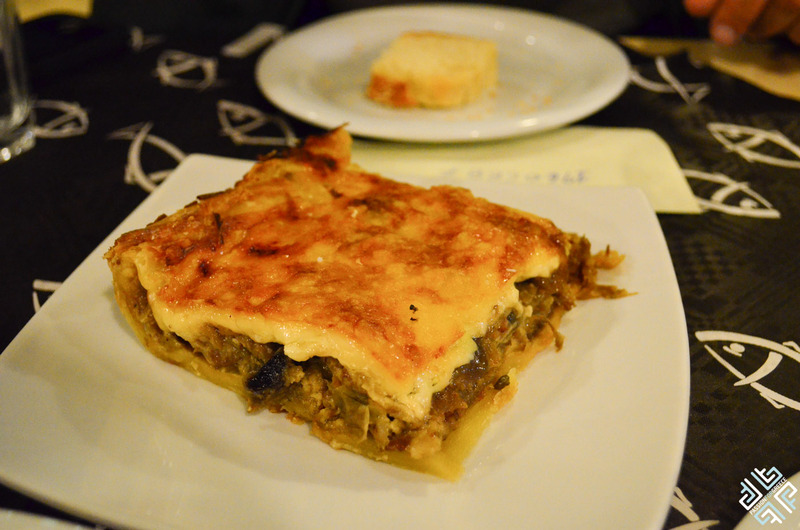 Now that I have told you the story of the name, let me tell you about the delicious home cooked food known as magirefta that Vasilis presented to us that evening. All the recipes prepared at the tavern run in his and his wife’s family and are prepared using the freshest ingredients. 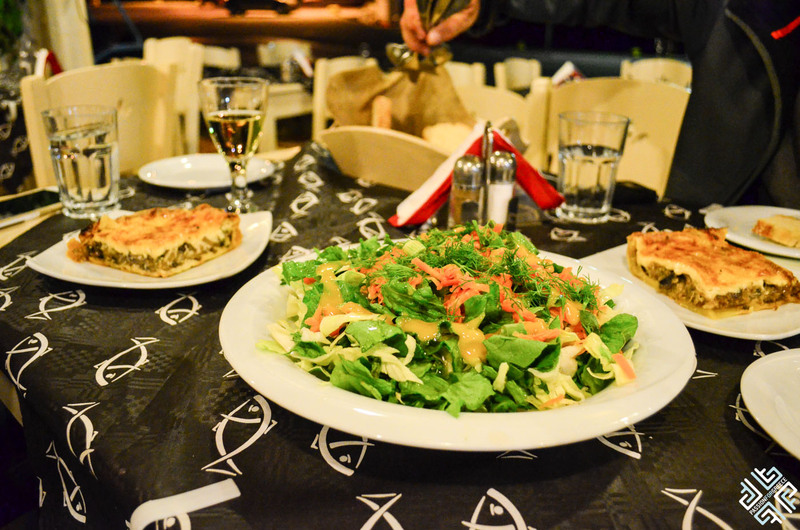 First we had a fresh green salad with lettuce, carrot and dill, and their specialties which are the mushroom and onion pies, an absolute must try. 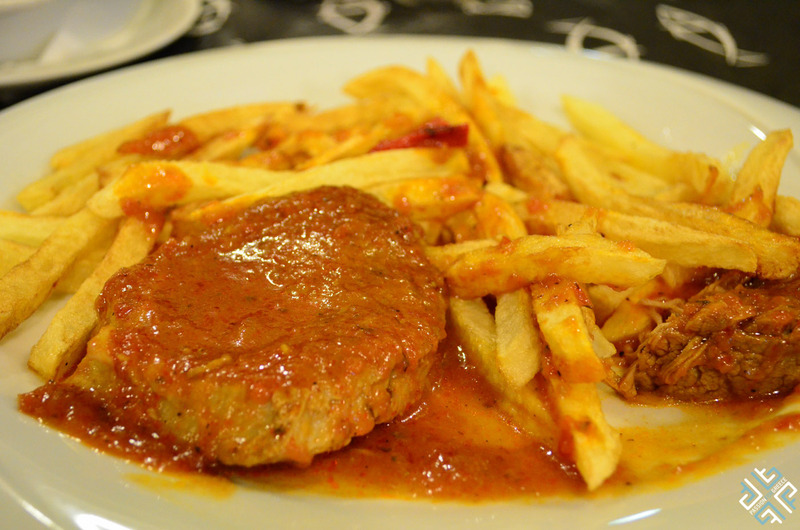 This was not final as a plate of soutzoukakia cooked in red sauce followed which is a traditional Greek meet dish and finally pork cooked in tomato sauce and served with French fries. We ate to our heart’s content! The tavern is located right in the harbour, where in the evening the atmosphere is very pleasant and relaxing as the crowd moves away from the port spreading over the island. Perhaps it was still early in the season, but for sure this delightful meal experience will be remembered.